A leasehold estate grants a tenant exclusive rights to use an owner's property for a certain period of time. Sometimes, although not always, leasehold estates are enforced by lease agreements, or contracts, that include specific terms and conditions for the tenant's use of a property and the landlord's obligations. 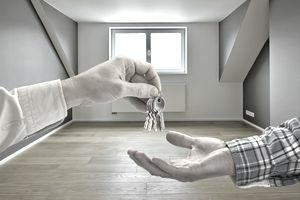 Landlords and tenants usually negotiate which type of leasehold estate will govern the tenant's occupancy, but sometimes circumstances beyond the control of one or both parties cause the courts to intervene and determine which type of leasehold estate applies. The Statute of Frauds in most states requires that leases over one year in duration be in writing to be enforceable. All written leases should spell out the rights and obligations of the owner and the tenant. Things such as rent amount, maintenance, repairs, and utilities are agreed upon in lease documents. In real estate, an estate for years typically lasts for several years. The defining feature of this type of leasehold estate is that it has a specified beginning date and ending date. When the lease expires, the tenant is expected to vacate the property without notice. Rent can be paid with any frequency spelled out in the lease agreement. The tenant has the right to break such a lease if there is a breach of contract or if he is allowed to break the contract under certain conditions. Also known as "periodic tenancy," an estate from period to period lease doesn't spell out a specific ending date but does specify periods of tenancy and rent payment, such as month-to-month. Both the tenant and landlord must give notice to vacate, as there is no defined termination date for this type of lease. Short- and long-term apartment owners usually require tenants to sign period-to-period leases. Note also that estates for years revert to period-to-period leasehold estates when expired. The most unstructured of the lease agreement types, an estate at will has neither a specified ending date nor a defined periodic tenancy such as month-to-month. For example, parents might allow their adult child to live on one of their homes under a leasehold estate at will. As is often the case when family members do business, an at-will leasehold estate typically has no documentation and may end only by legal intervention, such as would be the case if the parents served an eviction notice to their adult child. Estate at sufferance is a leasehold estate that arises when a tenant overstays his lease, occupying the property after the legal expiration or termination of the lease. In this type of leasehold estate, the tenant may decide to continue occupying the property and paying the rent. Estates at sufferance terminate when the landlord tells the tenant to vacate the property. For example, an absentee landlord might find herself dealing with an estate at sufferance where her tenant chose to stay long after his lease expired simply because no one asked him to leave.